October – I love it, I want it! Sadly October is soon ending so I thought I’d do my October – I love it, I want it! I literally have been loving a lot of clothing items so it was quite hard narrowing it down but yeah here go’s. 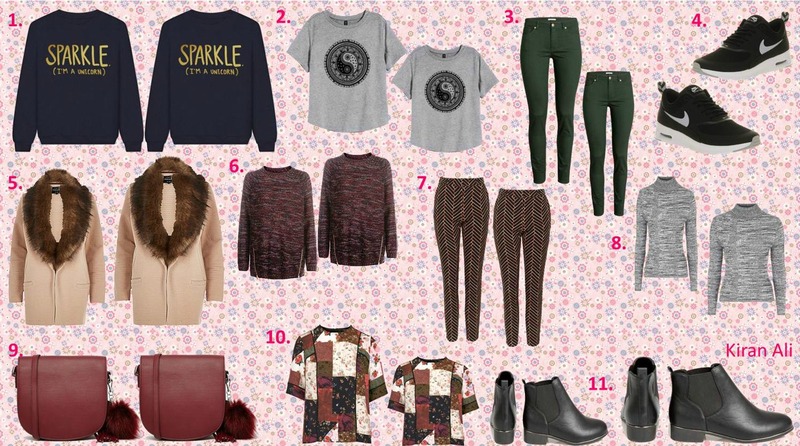 1.Unicorn Jumper – Rad. I saw this on Rad’s website and I was like its the most subtle blue colour I really need it. It can be so easy to style as well as layer other items with it too. 2.Grey Crop Tee – H&M. I just love these tribal kind of tees they’re perfect for A/W and look super cute with high waisted jeans. 3.Khaki Jeans – H&M. Instead of always wearing the same old black and blue jeans its good to experiment and I think this would look so versatile in A/W especially with complimentary items. 4.Black Nike Thea – Office. I recently purchased some Adidas superstars and I totally forgot my love for trainers and I’d love a pair of these as they’d go with so many outfits and I’m guessing they’re comfy as every other trainers. 5.Faux Fur Jacket – River Island. I have seen these everywhere and I guess I love the trend. This colour however I have seen as much which I think again is the best for A/W. It can be easily styled with any outfit adding that classy vibe too. 6.Boyfriend Jumper – New Look. Warm wooly jumpers are just essential as its getting colder day by day and I love this colour its so autumnal. 7. Orange&Black Trousers – Topshop. I think instead of always of wearing jeans its nice to change it up and recently I love the comfort of trouser and these are so pretty. 8.Roll Neck Jumper – Topshop. I have no words for the beauty of this I really need one as soon as possible it would fit in my wardrobe perfectly. 9.Tassle Pom Pom Bag – Asos.I hate having a big bag at this time of month so I think it’d be perfect to have a small cross body bag just for essentials. This berry colour is just so beautiful. 10.Patchwork Tee – Topshop. This has to be my favourite item of all. Its just so tumblr and pretty I love it and I do really really need it!!! 11.Chelsea Boot – Select. I went into town yesterday and tried these on and honestly they were so comfy and looked so classy so I think I really need to go back and purchase these. What’s your A/W clothing essential? Comment below. « 3 Easy Halloween Looks!